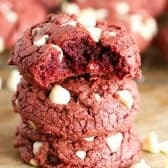 Red Velvet Cookies come out perfectly tender every time! Combine cake mix, eggs and oil until well mixed. Stir in white chocolate chips. Drop heaping spoonfuls on a parchment lined pan. Bake 8-10 minutes. Cool on a wire rack.